The following paper lays out a symbolic and geometric link between the area of Washington D.C., the capital of the United States, and the area on Mars known as Cydonia. The beginning of this finding began with a symbol that nearly every American has in their wallet or purse; the Great Seal of the United States which can easily be found on the back of the One dollar bill. According to the information in this webpage, the person claimed if you placed a hexagram, which is two equilateral triangles superimposed over each other, over the Reverse side of the Great Seal, five of the points in the hexagram would point to letters in the Latin words "Annuit Coeptis" and "Novus Ordo Seclorum" which translates to "Announcing the Beginning of" and "the New World of the Ages". These letters spelled out "ASMON" which is an anagram of "MASON". 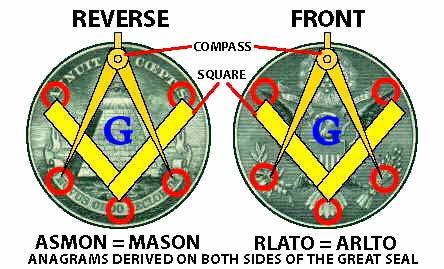 The word "Mason" is the shortened version of "Freemason". Even though the Freemasons say their fraternity has only existed since the 1700's, the information that I would find in this seal will lead to a much more ancient and remote source. About a two years later, I came across another website relating to Freemasonry and Washington D.C. According to a fundamentalist Christian website, the author found a map on a Masonic website that points out Masonic symbols embedded in the street patterns of the city. The fundamentalist Christian author believes the symbols have something to do with satanism and goes off on a tangent without understanding the real implications of these symbols. I believe these same patterns were embedded into the design of Washington D.C. for symbolic reasons related to Freemasonry and the "ancient connection" were going to discover later in this paper. On the above map, you can see an upside down star with one of the points touching the White House. Located just north of this star is the Supreme Council 33° Temple, the place where Freemasons become 33rd Degree Masons. Also visible in the area of the U.S. Capitol Building is the symbol of the Freemasons; the square and compass. The top of the compass is made up of the streets surrounding the Capitol building. Making up the left leg of the compass is Pennsylvania Avenue which reaches in a straight line from the U.S. Capitol Building to the White House. The right leg of the compass is partially made up by the section of Maryland Avenue that's between the U.S. Capitol Building and the modern day Federal Aviation Administration building. If you were to continue drawing a straight line while following the angle of Maryland Avenue, the line will end at the northern edge of the Jefferson Memorial which is directly South of the White House. 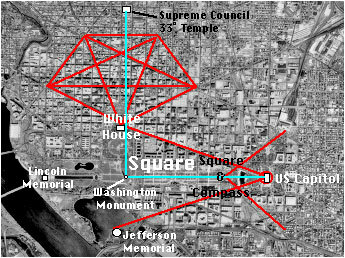 Another instance of connections between these symbols is a direct East to West line connecting the Capitol Building to the Washington Monument and a North to South line connecting the Washington Monument to the Supreme Council 33rd Degree Temple which is located 13 blocks north of the White House. The alignment of the North to South line from the Washington Monument to the Supreme Council 33rd Degree Temple implies that the real center of power in Washington is located in the temple. These two sets of lines make a right angle in the shape of a Square, from the Square and Compass symbol of Freemasonry. 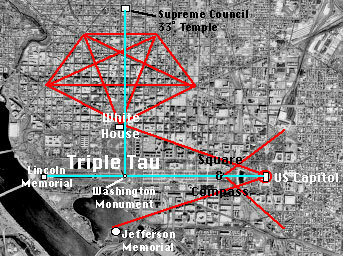 If you were to continue the East and West line from the Washington Monument to the Lincoln Memorial, the "Square" becomes and inverted T" with one leg pointing toward the Supreme Council 33rd Degree Temple and the other two legs pointing toward the Capitol Building and the Lincoln Memorial. According to Masonic symbology this is known as the "Triple Tau" which is decoded from the words "I am that I am" by using the Atbash Cipher in conjunction with the Hebrew Alphabet. It is also one of the symbols used by the Royal Arch Masons. "The Triple Tau, signifying, among other occult things, Templum Hierosolyma, 'the Temple of Jerusalem'. It also means Clavis ad Theosaurum - 'A key to a treasure' - and Theca ubi res pretiosa deponitur - 'A place where a precious thing is concealed', or Res ipsa pretiosa - 'The precious thing itself'." With the phrases "A key to a treasure", "A place where a precious thing is concealed" and "The precious thing itself" describing the Triple Tau it should be clear to anyone reading this that Washington D.C. was deliberately designed as the Masonic capital of the United States and is filled with hidden symbolic and metaphoric clues. If this is true for the capitol of the United States, was there more information embedded in the Great Seal? After speculating in the back of my mind for a period of time, I guessed that the hexagram that was superimposed over the Great Seal could really be some be some sort of partial "Anagram" generator. I noticed that the symbol of the Freemasons, the Square and Compass, makes a working substitute for super imposing a hexagram over the Great Seal and obtained the same resulting letters of "ASMON" by putting the eye of the pyramid between the two legs of the compass. Five points, two from the compass and three from the square, were pointed at the letters "ASMON" which is the anagram of "MASON". To test the Anagram Generator theory, I superimposed this same square and compass symbol on the Front side of the Great Seal and noticed that the same five points were super imposed over key areas of the Eagle on the Seal. According to history the original national symbol was going to be the turkey but the Eagle was chose instead. The only difference that this particular Eagle has a small tuft of feathers on the back of it's neck. From a mythological point of view, this eagle was really a symbolic representation of a Phoenix, an mythical bird that rose from the ashes after burning up in a funeral pyre. These letters spell out "RLATO" If you noticed from the previous decoding of "ASMON" to "MASON", the letter M was moved from the middle of this series of letters to the left side. So I did the same with "RLATO" by moving the "A" to the left side of this series of letters and got "ARLTO"
A strange thought occurred to me at this time. "MASON" and "ARLTO" seemed to be portions of names of both the fraternity of Freemasonry and a geographic location. By adding four letters, "FREE" to "MASON" you get "FREEMASON." If you take "ARLTO" and add the four letters "ING" & "N" in the appropriate locations you end up with "ARLINGTON". If a person were to take the "M" from "MASON" and turn it upside down, you would get "W" and the new series of letters from the reverse of the Great Seal would be "WASON". By adding the five letters of "HINGT" in the appropriate location the result is the name of the next geographic location; "WASHINGTON". If you add the five letters of "CHES" & "N" to "ARLTO" in the appropriate locations the result is "CHARLESTON"
What is the significance of decoding this anagramic puzzle? Lets take a look at what we got. From the Reverse side of the Great Seal, we eventually end up with the words "FREEMASON" and "WASHINGTON" by adding and adjusting the appropriate letters to "MASON". It's known that George Washington, whom Washington D.C. is named after, was a "Freemason" as well as many of the Founding Fathers of the United States. Today the majority of the most influential politicians serving in Washington are Freemasons. From the Front side of the Great Seal, we ended up with the words "ARLINGTON" and "CHARLESTON". These two words are the names for Arlington, Virginia and Charleston, South Carolina. What is the significance of these locations? Arlington, Virginia is the home of the Pentagon which is directly across the Potomac river from Washington D.C.
Another thing to notice are the connections between the words derived from both the front and reverse sides of the Great Seal. Freemason (from the Reverse) and Charleston (from the Front) symbolically connect with each other. The first Masonic Scottish Rite lodge in North America was founded in Charleston, South Carolina and both have the number 33 in common. Charleston is located near 33° N Latitude and the 33rd Degree is the highest degree attainable in Freemasonry. Washington (from the Reverse) and Arlington (from the Front) symbolically connect to each other by their symbiotic connection between the military presence of the Pentagon in Arlington and the White House in Washington where the Commander in Chief is located. 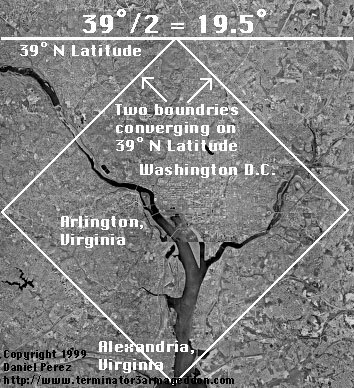 The geographic layout of both Arlington and Washington D.C. make up a square and it's northern most point touches 39° N Latitude which happens to be a multiple of a very special number; 19.5°. 19.5° can be found by dividing 39° by the two boundary lines converging on this latitude. Therefore, 39° divided by two gives us 19.5°. Over the course of several years of research, Richard C. Hoagland of the Enterprise Mission has found the number 19.5° in relation to Masonic and Ancient Egyptian symbology encoded in missions carried out by NASA. According to Hoagland, 19.5 is a number that is key to the geometric layout of ancient ruins at the Cydonia Region on Mars, which was photographed by the Viking Orbiter spacecraft in 1976, the year of the 200th Birthday of the United States, a country founded by Freemasons. 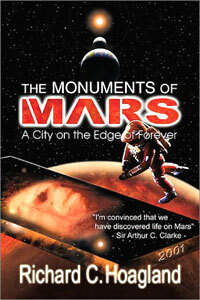 The Monuments of Mars, a book written by Hoagland, lays out the discovery of a geometric pattern encoded into the ruins of an ancient City and a Face like structure at Cydonia. This pattern shows that the artifacts at Cydonia are artificial in nature and were built by some race of intelligent beings. This complex was found in a series of photographs that were ridiculed by NASA and quietly filed away, one of them being photo 35A72 which contained the image of Cydonia. According to Hoagland, the key or "Rosetta Stone" to the Cydonia complex was a five-sided structure that was named the D&M Pyramid after it's discoverers, Vincent DiPietro and Gregory Molenaar. Further study of the D&M pyramid by Erol Torun, a cartographer for the Defense Mapping Agency, revealed the geometric alignments and connections between these Monuments of Mars. Multiple instances of 19.5 were found in this Pyramid and in the alignment of objects in the Cydonia region. After reading this book, I had an even weirder idea. If the number 19.5 is present in Washington D.C. and Arlington, Virginia by dividing the latitude by two, what would happen if I compared this area to Cydonia? Very weird connections. Since the D&M pyramid is the geometric "Rosetta Stone" of the Cydonia region, what kind of a large five sided object in the area of Arlington, Virginia and Washington D.C. would serve a similar purpose? Then it hit me. The Pentagon! The Pentagon was built in the 1940's by General Leslie Groves, the same general who was in charge of the Manhattan Project which created the Atomic Bomb. According to the Masonic conspiracy theory, King Kill 33° by James Shelby Downward, General Groves was a Freemason. 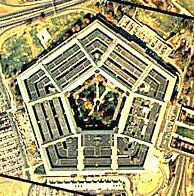 The Pentagon became the headquarters of the U.S. Military and is the largest office building in terms of floor space and contains miles of tunnels. "We hope this information will serve to eliminate some of the myths surrounding the Pentagon and give an appreciation of the size of the building". Why would the Pentagon be trying to dispel myths about an office building? Is there some symbolic purpose for the construction of this large five sided building? After seeing the layout of the Geometry at Cydonia in The Monuments of Mars and how three corners of the D&M pyramid pointed to the City, the Face and a circular hill-like structure called the Tholus it occurred to me that the same geometry existed in the area of Washington D.C. and Arlington. In other words, the Pentagon is the Rosetta Stone of this entire area. Using an old Rand McNally Atlas, I turned to the city map of Washington D.C. and began to draw lines from three corners of the Pentagon to areas that would have their counterparts at Cydonia. After using an image program to properly match the scale of an image of Cydonia with an image of Washington D.C. and Arlington, I superimposed one image over the other and several monuments from both locations match in terms of geometric layout and location. This was proof of the connection between Cydonia and the Washington D.C./ Arlington, Virginia area. I noticed similarities between the landmarks in the Washington D.C. / Arlington, Virginia area and the Cydonia landmarks. Since the White House is the headquarters of the "head" of the United States Government (the Commander in Chief), it was only natural that the human looking head or Face at Cydonia would correlate. The name Anacostia in Anacostia Park was derived from the Nacotchtank Indian word "Anaquah(a)-tan(i)" which translates to "town of traders". Near Anacostia Park, there is a six-way intersection made up of three streets. If you draw a circle with it's circumference crossing the diverging ends of each street that lead away from this intersection the result is a circular area that correlates with the Tholus at Cydonia. Located across the Anacostia river from this "Tholus Circle" is an intersection known as Barney Circle, a circular intersection on Pennsylvania Avenue at the Sousa Bridge. This circle geographically correlates with the "satellite" hill near the Tholus at Cydonia. The area of Rosslyn, Virginia is a tightly compacted city complex consisting of many buildings in a small area. 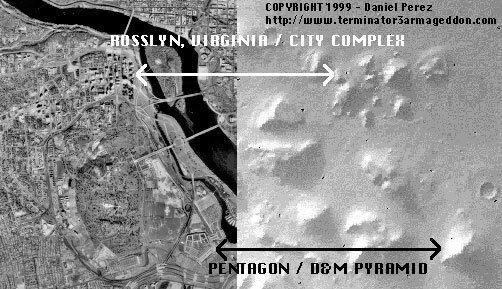 When the image of Cydonia is compared to Arlington, Virginia, the City Complex and the D&M Pyramid have the same proportional distance between them as Rosslyn, Virginia and the Pentagon. After getting this far I noticed that the landmarks pointed out by the Pentagon with three corners could be applied to the other two corners. I drew two more lines and ended them at an area that made the most sense symbolically and geometrically. The corner of the Pentagon facing toward the South-West pointed directly at an area called Bailey's Crossroads in Fairfax County, Virginia. I did some checking on the internet and according to the official webpage of Fairfax County, Bailey's Crossroads is located in the "MASON" district, an obvious reference to Freemasonry. The Pentagon corner facing South/Southeast pointed to another Masonic reference at the George Washington Masonic Memorial in Alexandria, Virginia. After finding all of these landmarks, I connected them with lines to make an even larger five sided pentagon that covered the Washington D.C./Arlington, Virginia area. The large pentagon geometry was offset slightly by being wider in the east, but symbolically it made sense. Why? This geometry was obviously designed to be looked upon by the "Great Architect of the Universe" who resides in the Eastern sky according to the Freemasons. 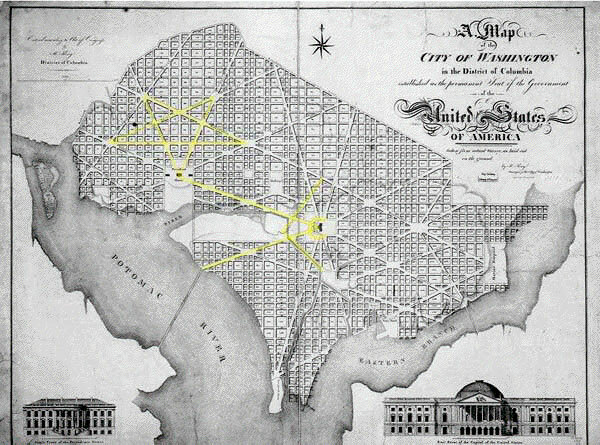 I also added the upside down star, the Square and Compass, and the inverted Tau symbol found in the map of Washington D.C. to show the connections between those Masonic symbols and the larger geometric layout revealed in this paper. The really strange part about this is discovered when you learn that Washington D.C. was built in the late 1790's, while the Pentagon was built in the 1940's, a time difference of 150 years, as if to imply this geometry is part of a long term plan. After laying out this geometry on a picture of the Washington D.C/Arlington, Virginia area, I superimposed the geometry over Cydonia and it matched. 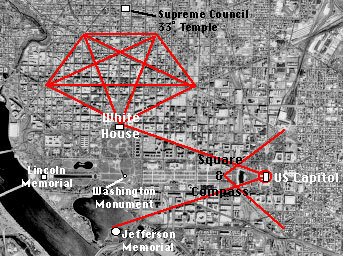 The D&M Pyramid, the Face, the City and the Tholus geometrically matched the locations of the Pentagon, the White House, Arlington in Virginia and the area known as Anacostia in D.C. The Washington D.C./Arlington, Virginia area is an exact geometric duplicate of Cydonia! Now, let's look at this in chronological perspective. The City of Washington D.C. was designed in the 1790's, the Pentagon was built in the 1940's and the geometry linking the Washington D.C./Arlington, Virginia area is a duplicate of the geometry of Cydonia. All of this was designed as part of a long-range plan spanning decades and centuries. According to many estimates, the date of the artifacts at Cydonia range from 300,000 to 3 Million years old or older. If that's the case, then how could the Freemasons, who founded the United States of America in 1776, have knowledge of Cydonia geometry at least two hundred years before the Viking Orbiter photographed Mars in 1976? There's only one obvious and correct answer. The Freemasons have possession of knowledge passed down through history from an ancient inter-planetary civilization that existed thousands of years before "official civilized history" supposedly began 6,000 years ago in the Middle East. Return to The Secret History of America’s Capital: Washington D.C.